Above: Beautiful Model Caroline Trentini Modeling For The Cover Of Elle Brasil Magazine Photographed By Gui Paganini For Elle Brasil Magazine High Fashion Editorial. Meet beautiful Brazilian blonde model Caroline Trentini as she prepares backstage for the Carolina Herrera Fall Winter fashion runway show in New York for New York Fashion Week. Caroline Aparecida Trentini started her high fashion modeling career when she was 15 years old. 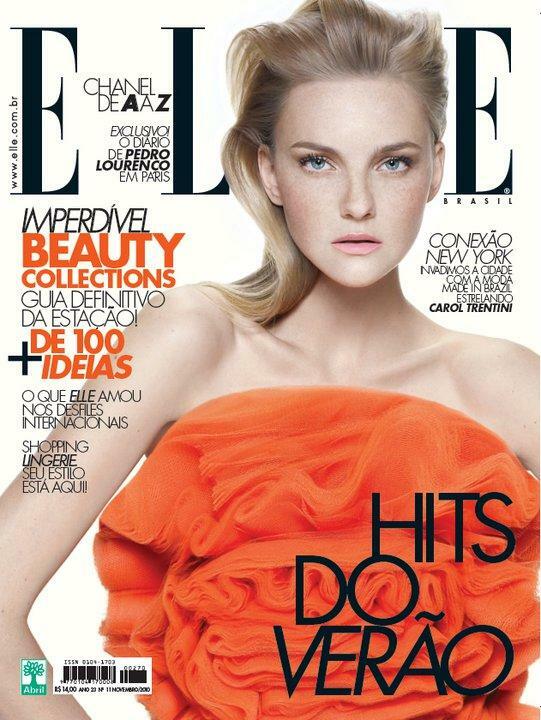 Originally from Panambi, Rio Grande do Sul, Brazil, Caroline Trentini due to her incredible beauty has steadily worked with the top fashion clients in the industry. Caroline Trentini is of Italian and German descent and the blonde green eyed beauty was discovered walking down a street in her hometown by an agent, the same one who scouted supermodel Gisele Bundchen, and soon afterward she moved to São Paulo, the common destination for young Brazilian models. 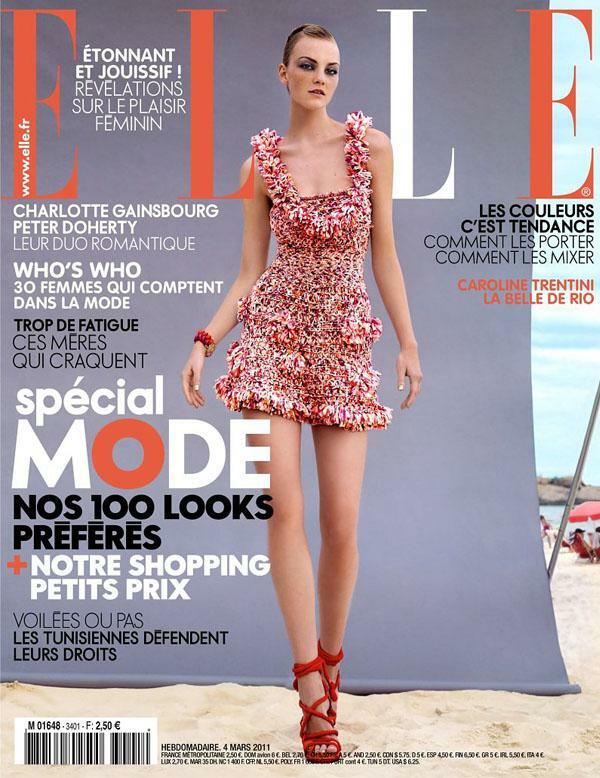 Above: Beautiful Model Caroline Trentini Modeling For The Cover Of Elle France Magazine Photographed By Jean Baptiste Mondino For Elle France Magazine High Fashion Editorial. Caroline Trentini's breakthrough came when Marc Jacobs himself cast her in his Marc by Marc Jacobs advertising high fashion campaign. Caroline Trentini has appeared in coveted runway spots at shows such as Louis Vuitton, Valentino, Versace, Chanel, Christian Dior, L.A.M.B., Baby Phat, Vera Wang, Oscar de la Renta, Ralph Lauren, Calvin Klein, and Dolce & Gabbana. Caroline Trentini has also appeared on the covers of magazines such as Vogue, ELLE, and Harper's Bazaar, among other major national and international high fashion magazines. 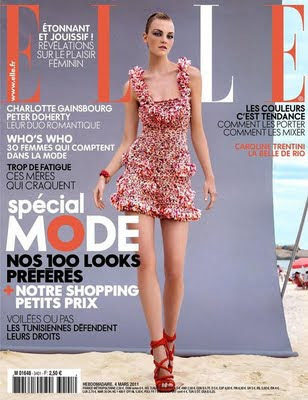 Caroline Trentini was also featured in the May American Vogue editorial with boyfriend Victor Demarchelier who is a photographer and son of famous photographer Patrick Demarchelier. Above: Beautiful Models Caroline Trentini And Chanel Iman Modeling For The Express High Fashion Advertising Campaign Photographed By Patrick Demarchelier.